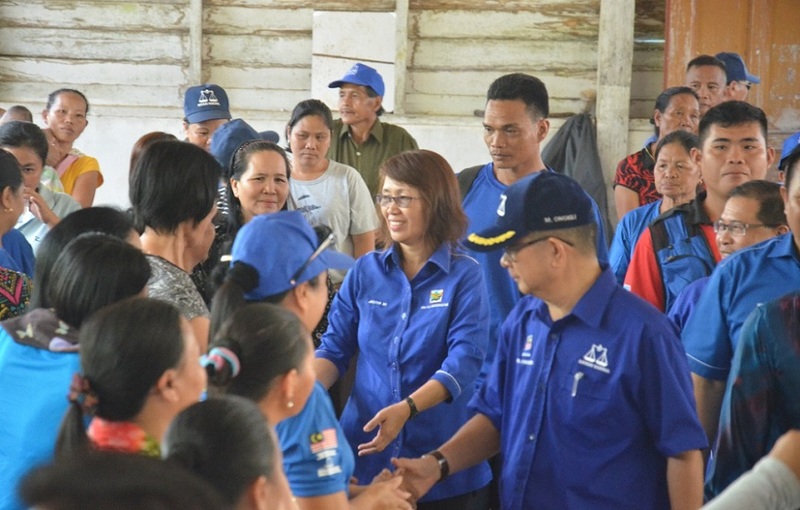 Ongkili and Julita Majungki, the BN candidate for Matunggong were greeted by grassroots during their visit to the Matunggong District Polling Centre on Monday. 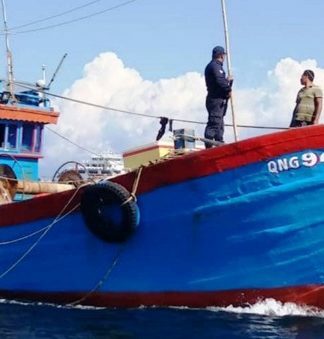 KOTA MARUDU: It is all about hard work and teamwork in Matunggong, especially if Barisan Nasional wants to recapture the seat this time around. “We cannot afford to be complacent about Matunggong … there is no space for us to be slacking off. 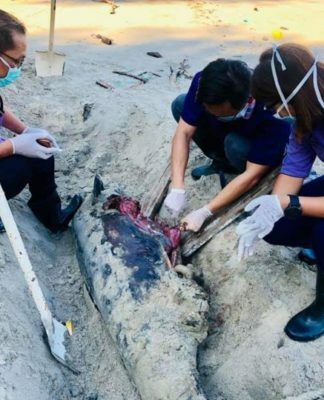 We cannot be too proud and claim that we can win (Matunggong) easily,” Dr Maximus Ongkili, the Parti Bersatu Sabah deputy President advised party members, Monday. Calling for full commitment, not just from PBS members, but also all BN component parties’ supporters, he said only through cooperation and hard work from all parties can victory be possible for N4 Matunggong state seat. Speaking when visiting the Tigaman and Matunggong district polling centres, here, together with BN candidate for Matunggong, Julita Majungki (PBS), he said BN component parties must stay united to fight their common enemies. 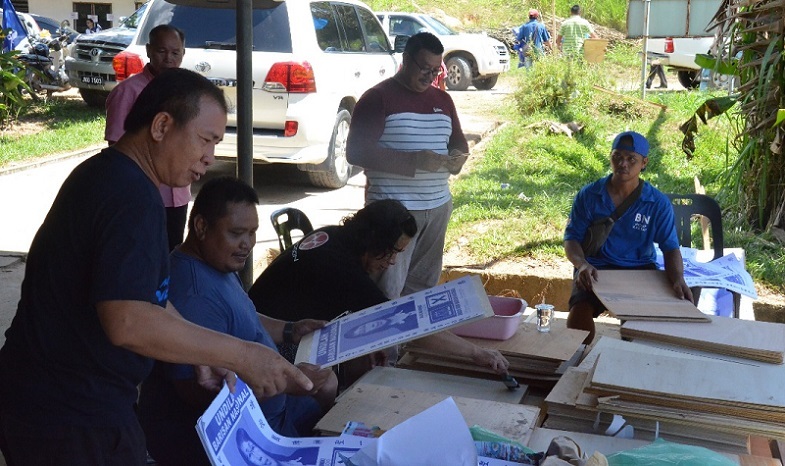 Party workers making sure posters of their PBS candidates are all in order. “We must win all our lost seats. Your commitments and support count. 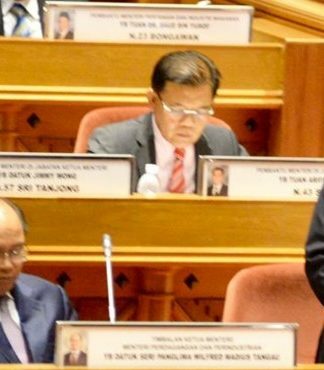 Even the incumbent Matunggong assemblyman has pledged his support and ensure BN’s victory for the seat,” said Ongkili, who has been entrusted by the PBS Supreme Council Members to carry out the party’s presidency duties. The incumbent Kota Marudu Member of Parliament said Majungki’s participation in the fray is not just an honour for women, but also shows that PBS appreciates and recognises their ability to be lawmakers. “Please support her (Majungki). She maybe a new face in the fray, but she is no stranger to politics. Apart from her, we (PBS) also fielded three other women this election – Mary Yap (P190 Tawau), Linda Tsen (P185 Batu Sapi) and Anita Baranting (N5 Tandek). These are PBS iron ladies,” he said. Speaking on his manifesto for Kota Marudu, Ongkili, who is also the BN Kota Marudu chief, pledged to continue bringing development for his constituency. “BN is not like the opposition who likes to throw promises, which they may not be able to fulfill. We have plans to develop the constituency and I will make sure it happens. “Matunggong has the criteria to become a full-fledged district, and with the potentials in infrastructure and economic development, I believe it can be a reality,” he said.